Never been skiing or riding? Here is some information first-timers have found very helpful. You can also check out our Frequently Asked Questions page for more info. 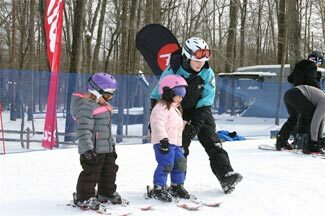 We strongly recommend that all first time skiers and snowboarders take lessons. A lesson from one of our trained professionals is going to ensure that your first experience is a positive one. We will help you with everything: dressing properly, equipment selection, starting, stopping, turning, lift usage, as well as how long to stay out your first time and where to practice for the most success. Where do I go when I arrive at Powder Ridge? If you require rental equipment or lessons you will head to the Rental and Training Center which is the building on the left. If you just require a lift pass you can go to the main lodge. Lockers are available in both buildings. How do I rent gear? Our Rental Department opens an hour earlier than lifts everyday. We recommend filling out the rental form online prior to your visit. This only needs to be done once. If you have a reservation for a lesson and require rental gear, you should check in at least 30 minutes prior to the start of your lesson. Arrive at least 1 hour prior to the start of your lesson on weekends and holidays. Helmets are mandatory at The Ridge and can be rented. Why should I take a lesson from the Powder Ridge Training Center? First-time skiers and riders who take a lesson from a professional are much more likely to ski or ride a second or third time than those who don’t. Our staff has a minimum of 30 hours of instructor training before we introduce them to you. Most have hundreds of hours on snow. We use Terrain Based Learning to ensure a positive experience. This means we have shaped the snow in our learning area to provide novice level skiers and riders with high level sensations in a safe and secure manner. We will guide you through a proven skill progression that will give you the abilities you need to be an independent skier or rider, getting you out and enjoying the mountain fast. Playing in the snow at Powder Ridge can be great fun. Dressing to stay warm is one of the best ways to make sure it is. Dress in Several Thin Layers – The first layer should be a wicking material to keep moisture away from the skin. 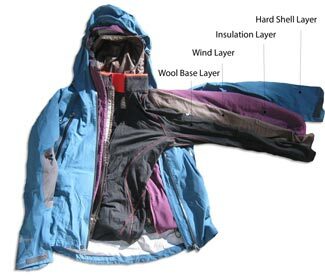 Never use cotton as a base layer if other options are available (most long underwear is either wool or polyester). For colder days, a fleece top or jacket, or cotton turtleneck makes a good second layer. Feet need to stay dry too! Moisture-wicking socks work great for this purpose. Only wear one pair of socks. Multiple pairs wrinkle and bunch up in the boot, causing discomfort. Change into your ski socks when you change into your boots. Everyone’s feet sweat (especially after riding in a heated car) and a sock that is already damp will not keep your feet dry as long. Waterproof Pants and Jacket – Staying dry while playing in the snow is very important. Once the clothes are wet, staying warm is virtually impossible. Remember, there is a difference between “Water Resistant” clothing and “Waterproof” clothing. The product descriptions will specify what level of water protection clothing provides. Depending on how cold it is, you might want to have your child’s pants and jacket both waterproof and insulated for warmth. In Spring conditions, insulation might be too warm. Waterproof Gloves or Mittens – Mittens are always warmer than gloves. For some people, mittens can be too warm and hands will get cold because they become damp. Once skiers are old enough to have the dexterity to benefit from each finger, gloves may be a better choice. It has been our experience that mittens are better for young kids. Goggles or Sunglasses with UV400 Protection – Children may not be as interested as adults are in the fashion aspect of “fashion eyewear.” But because kids spend much more time than most adults do outdoors and in direct sunlight, protecting kids’ eyes from ultra violet is especially important. Lenses in kids’ sunglasses should be clearly marked as capable of providing 100 percent UV protection, with UV400 rated lenses. For many people, goggles are a necessity when its snowing or windy. In very cold weather they provide added warmth by covering the face. Additionally, since they attach to most helmets, they are less likely to get lost than sunglasses. Helmets – Powder Ridge requires helmets for all. Ensure the helmet fits correctly. 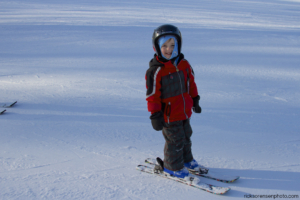 A ski helmet is not an item you buy for your child to grow into. Educate your child about the benefits and limitations of the helmet. Wearing a helmet doesn’t give permission to ski or snowboard faster or recklessly. Our Training Center rents helmets, and includes them in all our rental packages. Sunscreen and/or Face Covering – The sun reflects off the snow and is stronger than you think! A ski vacation with a sun burn is no fun. Sunscreen also reduces evaporation and can therefore help prevent frostbite on very cold days. A balaclava, face mask, or scarf is the best protection against frostbite. Lastly, winter air is very dry; this greatly increases the chance of chapped lips. Plenty of lip balm is a necessity to avoid this.